At approximately, 5:45am on Wednesday, February 12, 2014, the unthinkable occurred caught on video. 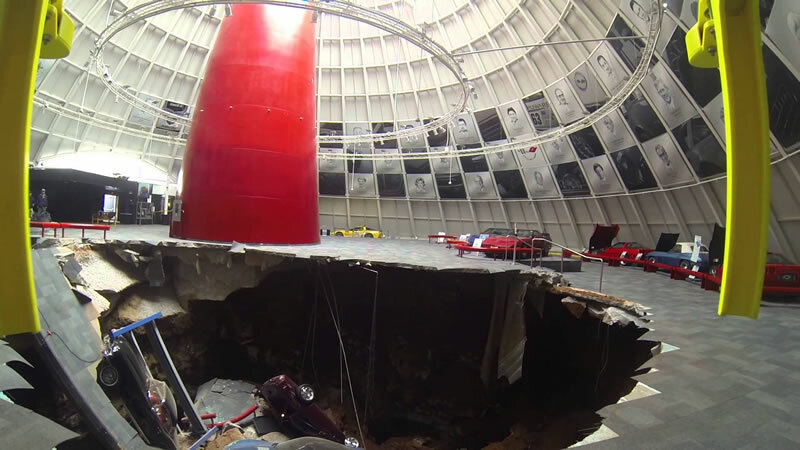 A 60-foot-long, 45-foot-wide, 30-foot-deep sinkhole developed under the ground of the Skydome at the National Corvette Museum (NCM) swallowing eight collectible Corvettes. A couple of these Corvettes were privately owned and on loan to the NCM for display. Others were prototypes on loan from General Motors such as the 2009 Corvette ZR1 “Blue Devil” and the One and half millionth Corvette produced. What followed for over a month afterwards, was a slow and methodical process of extracting those Corvettes from their near demise and determining how to fill in the sinkhole with the intention of turning doom into profit. With the help of GM, who immediately stepped up to the plate and volunteered to bring the prototypes back to Detroit to be completely rebuilt, and donations from NCM members and visitors, the “Corvette Cave-in! : The Skydome Sinkhole Experience,” a new exhibit at the NCM is scheduled to open next month. The 1,000 square foot exhibit, was designed and constructed by Creative Arts Unlimited of Pinellas Park, Florida and shipped to the NCM. Coming up on the two-year anniversary of the sinkhole, visitors to the NCM will be able to walk through a new permanent exhibit that will be electronically interactive including 3D technology and actual rock samples, in order to detail the collapse, the work involved to extract the cars, and the rebuilding effort to both cars and Museum. To top it all off, the exhibit will include what the NCM calls “Look Below the Surface.” At the edge of the exhibit right above the sinkhole is a 48-inch manhole that leads into one side of the cave. Visitors can look right through the window to see the floor of the cave below. previous Has This C6 Corvette Been Turned into a Swan or an Ugly Duckling?